With limited time for additional green lesson plans, we wanted to share EASY tips to incorporate environmental stewardship into your daily routine. You have the perfect opportunity to expose your students to the importance of conservation by including these simple steps. Shared responsibility is key. If you have a “task” or “job” list, include Light monitor and recycle ninja. 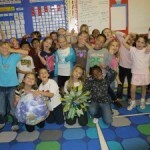 Explain to students at the beginning of the year why it is important to conserve Earth’s resources. Collectively, little efforts lead to big results. Turn off your computer monitor at night and sleep it during the day while not in use. Promote reusable water bottles with leak-proof lids. Designate a Light Monitor. This person is responsible for always turning out lights when you leave the classroom. Leave lights off on sunny days and explain to kids you are conserving energy by using natural lighting. Create a student job as Recycle Ninja. Just like your light monitor, this person is responsible for consolidating recyclables and ensuring no trash is left in the recycle bin.